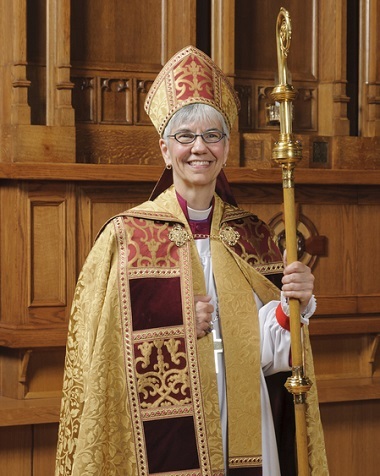 Melissa Skelton has been elected Archbishop and Metropolitan of the Ecclesiastical Province of BC and Yukon. When Melissa Skelton was elected an archbishop last weekend, she became part of a very select club. There are now two female Anglican archbishops in the world; the first, Kay Goldsworthy, was installed just a couple of months ago in Perth, Australia. Skelton was chosen as the 12th Archbishop of the Ecclesiastical Province of BC and Yukon – part of the Anglican Church of Canada – May 12. She has been Bishop of the Diocese of New Westminster (which includes all of Metro Vancouver and the Fraser Valley) since 2014. I had a career in college teaching – I taught college English – and then went and got an MBA and was in the business world for a while. Actually, I did that while also doing a masters in divinity, so I was drawn really in two directions at once, and kind of meandered between the two for a while, and then settled much more strongly on the church side, and haven’t really looked back on that. . . . I don’t see the world as split into portions or unrelated parts. I really see it in a holistic way, and so, for me, everything that has been a part of my story has brought me to today. . . .
We probably, in the Anglican Church of Canada, have the highest percentage of women bishops of any place in the [worldwide Anglican] Communion. So it’s a place where more and more women are being elected, so I feel like we lead in that regard. With that said, not just in the religious realm and in the church, but in all aspects of work and civic life there’s that unconscious bias that expects women to do certain jobs and not do others, and that inhibit women themselves from putting themselves forward for leadership roles. All I have experienced in Canada, in my role, has been collaboration and cooperation. Really. And I’m astonished to say that, but it is what I would say from my personal experience. Go here (beginning at 1:21) for the full interview. 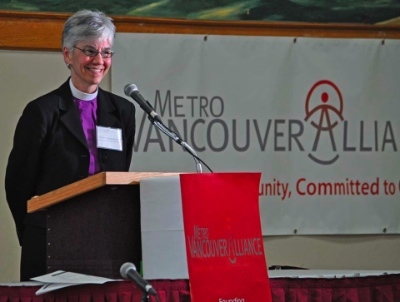 The primary ministry of the new Archbishop and Metropolitan will be to continue as diocesan bishop in her diocese, the Diocese of New Westminster. Beyond that ongoing diocesan ministry, providing pastoral care to the bishops of the ecclesiastical province is at the heart of the added archiepiscopal ministry. Fostering unity and harmony within the ecclesiastical province is another. And in conjunction with the other three provincial archbishops and metropolitans, assisting the Most Reverend Fred Hiltz, Primate of the Anglican Church of Canada is an important function. New Westminster (the urban and suburban communities of Greater Vancouver and the Fraser Valley including the Sunshine Coast, from Powell River to Hope). 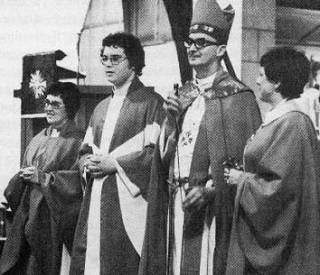 It is just over 40 years since the first Anglican women were ordained in Canada. According to a page on the Anglican Church of Canada website devoted to the ordination of women, the first six ordinations of women as priests in Canada took place in 1976. Three of those took place in dioceses which are part of the Ecclesiastical Province of BC and Yukon. And two of those – Rev. Elspeth Alley and Rev. Virginia Briant – were ordained at Christ Church Cathedral in Vancouver. The first woman bishop in the Anglican Church of Canada was the Rt. Rev. Victoria Matthews, elected in Toronto in 1993, though she did not become a diocesan bishop (in Edmonton) until 1997.